Pump Track Grand Opening June 22 – 4 pm • Get Your Bike Trail On. Get Your Bike Trail On. This event is intended as a celeibration of the Grand Opening of the Bicycle Pump Track in the City of Reno Panther Valley Park. The Pump Track was built through volunteer efforts of the Poedunks. Inc. and the Tahoe Area Mountain Bike Association (TAMBA). The City Council granted final approval of this volunteer agreement/project on May 23,2012. 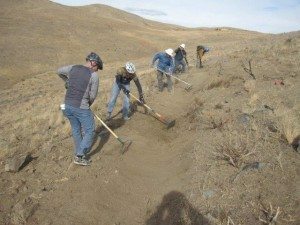 Through many volunteer hour and in-kind donations of heavy equipment the project will be complete and ready to ride on by June 22 at virtually no cost to the City of Reno. At the event there will be a loud speaker system for a short dedication/ribbon cutting ceremony. Black Rock Bicycles will be hosting hot dogs and beverages. There will be bike riders on the track doing demo ride. We will do a press release to attack media to promote the new track. The Poedunks and TAMBA would love to have any City Council members available and City Staff that helped on the project there to help celebrate a great new resource for the citizens of Reno. This was formally an under unitized bicycle BMX track. The Poedunks and TAMA have transform the old BMX track into a modern style Pump Track that can be used by almost any bike rider of any age.